Improved understanding of the global challenges and sustainability implications surrounding mineral resources is critical to the management of these resources and guidance of social and technical innovation and related public policy. Mineral resources considered in our discussions include metals and industrial minerals but do not include fossil energy resources such as crude oil, natural gas and coal. Many mineral resources are relatively abundant in Earth's crust, but increasing worldwide resource demand is raising concerns about their scarcity, prices, and environmental impacts. This chapter focuses on metals, because they provide the clearest example of the challenges and opportunities that mineral resources present to society, in terms of both primary production and recycling. The major metals, including iron and aluminium, are distinguished by their relative abundance in Earth or their economic importance; other metals are designated as minor metals. Demand for most metals is rising, especially for a number of minor metals, which have specialty applications that depend on their unique properties. Assuring adequate supplies of the minor metals is a concern as they are often mined with a host, in most cases a major metal. Accessing both major and minor metals brings with it a host of geopolitical challenges, such as refusal of access to mineral-rich lands, substantial requirements for energy, water, and human resources as well as damages associated with use of land for mining and the generation of tailings and other wastes. Recovering metals from products at their end-of-life (EoL) is accompanied by technical and societal constraints. In this chapter, we identify basic concepts and information requirements and describe sources of consumer and industrial resource demand as well as the destabilizing effects of volatile resource prices and supply chain disruptions. We elaborate on the challenges facing extraction of in-ground resources and production of secondary resources and consider scenarios for the future. Key research questions are posed and modeling and data priorities discussed, with an emphasis on areas that require novel concepts and analytic tools to help resolve environmental challenges associated with minerals. Mineral deposits refer to stocks of mineral resources in the ground: primary production generates mineral fl ows from these in-ground deposits, and secondary production recovers mineral-derived materials through recycling. The secondary stock includes durable products and infrastructure in use (including strategic stockpiles, which are also a resource stock). 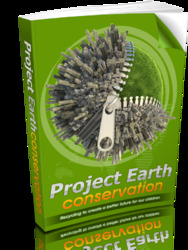 Products at the end of their useful lives are available for recycling of constituent materials. Tertiary stocks refer to goods that have been discarded, generally within landfills, which constitute complex mixtures of materials and metals but also plastics and other associated materials included in products for functionality. Figure 11.1 Flow of a single mineral resource from deposit into the economy. Rectangles represent stocks, arrows show flows, and ovals depict processing activities. The solid horizontal line represents the boundary between the lithosphere and anthropo-sphere. "Product" denotes the stock of in-use products and infrastructure. products which comprise most consumer goods. After manufacturing, the materials are embodied in products that flow to consumers and increase the in-use stock. In-use stock is decreased as products leave it to flow either into landfills (if take-back or other EoL systems are not in place) or recycling facilities. Landfills comprise a tertiary stock which may be decreased if contents are removed for recycling. Thus flows account for the additions to and subtractions from existing stocks. Studies that examine sustainability issues using material flow analysis (MFA), life cycle assessment (LCA), and input-output (IO) analysis are discussed below. Models of fundamental physical and thermodynamic properties of the complex interlinked mixtures of metals, plastics, and building materials (see Reuter and van Schaik 2008a) as well as models of potential policies and behavioral reactions will also be required. In this section, we describe basic requirements that are needed to support the analysis of the sustainability of mineral resource use. The U.S. Geological Survey provides information about identified primary stocks of most nonfuel minerals. The most comprehensive summary of this data is in the Mineral Commodity Summaries, which report reserve and reserve base information for individual countries. Other governments—notably those of Canada, Germany, France, Japan, Australia and South Africa—provide similar information, usually focused on their domestic mineral production. These data are most complete for the major metals and commodities such as Cu and phosphate, but less so for minor and by-product metals such as antimony and rhenium. Most production data are generalized and do not include information for specific deposits, although some information of this type can be obtained from annual and 10-K reports of publicly held companies. Information on the size (grade and tonnage) of individual deposits can also be obtained from these sources, and the U.S. Geological Survey and Geological Survey of Canada provide some databases with information for specifi c deposit types or commodities. Other databases, particularly on specific deposits, are available from consulting organizations such as the Raw Materials Group, the American Bureau of Metal Statistics, and trade organizations for individual commodities ranging from aluminium to zinc. As compilations of primary mineral stocks by these and other organizations extend their coverage, we encourage the development of a database format. We recognize that not all mines operate on single deposits and that not all deposits are exploited by a single mine. From a stocks and flows standpoint, this complication is best addressed by compiling information on mines, although it might be necessary to use deposits for those with no active exploitation. In either case, information that would be useful includes the name of the mine or deposit, its location (latitude and longitude), geological type of deposit, major elements produced and their rate of production, associated minor metals, grade and tonnage of ore extracted, processing method and wastes from processing, and specific information that provides insight into the economic character of the deposit (depth, ore quality). Data sources for secondary stocks, which quantify durable consumer goods and infrastructure as well as their age and composition, require sources that are entirely distinct from those for primary stocks. One must distinguish products by components and by composite materials versus individual metals. The complexity of consumer products makes it necessary to consider not only individual materials but also to capture their interconnectedness in products (see Reuter and van Schaik, this volume). Some companies and trade groups maintain databases on secondary stocks related to their businesses. The highest priority is to focus on material-intensive, mass-produced products, such as vehicles and electronic devices, including secondhand use of products in developing and transition economies. A classification of the items comprising the in-use stocks is needed, along with data specifying their average material compositions and lifetimes. Longer-term priorities are to describe tertiary stocks, in particular EoL distribution of a few key consumer products and their logistical recycling constraints. Models of the fundamental properties of mixed materials can render MFA models scaleable down to the product level, a development that is currently underway and will have its own data requirements. Likewise, policy-oriented models will require the quantification of parameters describing the behavioral responses of major actors. For all economy-wide models, estimates of the maximum annual exploitable supply of a resource in a given country or region is needed. These will depend upon current prices as well as on the sizes of the various stocks and the capacity of the infrastructure in place to exploit them both directly and in downstream processes, like smelting and refining. The ultimate purpose of human industry is to provide the structures, goods, and services desired by civil society. The most resource-intensive requirements include public and private infrastructure (e.g., roads, dams, buildings, production facilities and housing) as well as durable goods (e.g., motor vehicles, cell phones, and computers). National economic accounts are compiled on a regular basis by national statistical offices in most countries and include IO tables. These tables record the money values of all transactions that take place in that economy for a given year in terms of several dozen to several hundred widely used industrial classifi cations. The IO tables track fl ows of goods among industries and, for each industry, several categories of other money outlays that comprise value added. In addition, the tables quantify the value of product flows to several categories of final uses, or final demand, distinguishing in particular domestic consumption and investment, both public and private, as well as foreign imports and exports. Domestic final demand consists of a basket of goods produced by a variety of construction and manufacturing industries. There is, of course, final demand for everything from food and clothing to energy and paper clips, all requiring resources for their production, either directly, as in the case of paper clips, or at least indirectly. Typically, items which have longer in-service lifetimes are the most important, both in terms of their intensity of material use and for the opportunity provided by this secondary stock for material recycling. Batteries, however, are an example of a product with a short lifetime that are important to recover. Final demand is driven by the size of the population, its level of affluence, and cultural norms. World population of around 6.7 billion is expected to level off at 9-10 billion by the middle of this century, with virtually the entire increase experienced in the developing and transition countries. The latter contain already most of the world's population, and their rates of economic growth and increasing consumption are impressive. Consumer aspirations include larger and more comfortable living spaces and personal motorized vehicles, and their governments are putting in place enormous amounts of infrastructure, such as extensive transportation networks in western China (He and Duchin 2008). While demographic realities and lifestyles are major drivers of consumer demand for products and therefore of resource requirements, technological change significantly influences the resource-using manufacturing sectors of the economy. Product innovations affect the composition of final demand while process innovations in mining, material-processing, and manufacturing sectors determine the demand (per structure or per unit of product) for specific materials. Abundant materials tend to be relatively inexpensive and therefore widely utilized, and changes in resource availability and price have an enormous influence on substitutions among materials. So obviously does the design of new materials, including the emergence of nanomaterials whose eventual impact on material use is currently difficult to evaluate. Another important factor is legislation involving use or cost of specific materials including subsidies. As populations grow and resource use increases, the role of recycling will expand. Recycling will never be 100% efficient and varies greatly among different mineral commodities due to use and functionality in their respective applications. Thus, the need for new primary resources is unavoidable. Changes in resource prices have an enormous impact on the decisions taken by private corporations because of the direct relationship to profit margins. Stable prices encourage investment in mining and processing (extraction). Unfortunately, prices for many mineral commodities are highly variable and respond to relatively small changes in the balance between production and use. These changes may be a response to short-term events, such as collapse of the wall of a large open-pit mine, which shuts down production for a few months, or long-term trends, such as growing demand for a metal because of a technological change. Prices may refl ect speculative demand for materials, such as the large investments in raw materials made by hedge funds during the late 1990s and early 2000s. Prices are also affected, either positively or negatively, by government actions, ranging from changes in the monetary use of metals (e.g., departure of the U.S. from the gold standard in the 1970s) to regulations requiring decreased use of metals (e.g., lead and mercury in consumer products, which occurred in response to environmental concerns in the 1970s). Finally, prices respond to hoarding or cartel activity, although very few actions of this type have been effective over the long term for mineral products, other than oil and diamonds. The capacity of raw mineral producers to behave strategically when faced with price fluctuations is limited because most are large-scale operations with substantial fixed costs. When short-term prices rise and new operations come online, the incremental output may exceed the change in demand that drove the price upward in the first place, resulting in depressed prices and stressing all operations including the new ones, many of which are closed permanently. Legislation that would allow them to remain dormant for long periods and then be opened and closed as price fluctuates, without requiring official approvals at each transition, could be helpful. Several other factors can help mitigate undesirable effects of price fluctuations. Recycling is very effective during periods of high or increasing prices but risks discontinuation during periods of declining prices. Better product design can lower recycling costs and allow recycling to be competitive over a longer part of the price cycle. High prices can motivate innovation and substitution of the high-priced material, such as the recent substitution of cobalt with other metals. However, for many minor elements, the flexibility of this approach is limited by special product requirements and functionality. The increasing complexity of supply chains is another important source of disruption. Specialization and outsourcing have made supply chains longer and globalization has dispersed them geographically, while lean production practices have reduced or completely eliminated the buffer provided by inventories. All of these factors render supply chains more vulnerable to disruptions due to physical threats to production and transport (e.g., natural disasters, military conflicts, terrorist attacks, political turmoil, or epidemic diseases). Other forces for change are market shifts due to imbalances between supply and demand, monopolistic control of sources and transport, or changes in government policies. Countries that have exported their mining and refining industries as well as recycling activities to other countries may be particularly vulnerable. Some industrialized regions and countries, such as the EU and Japan, have created extensive recycling and energy recovery infrastructures. Access to certain materials is often of strategic importance for countries, and government stockpiles to insure national security are one option for mitigating potential supply chain disruptions (NRC 2008). Most classifications identify aluminium, copper, iron, lead, nickel and zinc as the major metals, although tungsten and tin are sometimes included in this group. Most other metals are considered minor metals. Although there is no generally accepted definition for this group (see also Hageluken and Meskers, this volume), they occur largely in low ore concentrations, have relatively low production or usage, and are not traded on major public exchanges such as the London Metal Exchange. Gold, silver, and platinum group elements are minor metals in terms of their presence in the Earth, but their high values make them major metals from a commercial standpoint, and they are often called precious metals. The designation of a metal as major or minor may change over time. For example, aluminium was a minor metal before 1900, whereas today it is the second most commonly produced metal globally and is classified, under any definition, as a major metal. The term minor metal is also used to refer to metals that are special in that they have unique properties that make them valuable for high-tech applications: this is the meaning intended in this chapter. Thus, the classification of a metal as "minor" in no way infers that it is minor importance, but simply that it is not mass produced, which makes their recycling especially important. Most minor metals are geologically closely connected to certain major metal deposits; mine production depends heavily on that host metal. Examples include cobalt and molybdenum, which are linked to copper, and indium and germanium, which are associated with zinc. Therefore, if major metal prices decline and hence also mining activity, the recovery and availability of minor metals declines as well. Such by-products or coupled products lead to highly complex demand and supply and price patterns, although there are a few examples of minor metals extracted on their own (e.g., lithium and tantalum). The fact that the minor metals are sometimes produced in very few geographical locations makes their supply precarious (e.g., tantalum and niobium). Land considerations pose a major challenge to primary production of mineral resources in two main ways. First, and most obvious to the nonspecialist, is the impact on the l and of mineral production, involving primary extraction of the ore (mining), processing of the crude ore to isolate the mineral or compound (benefi ciation), and further processing to yield a pure metal or other product (metallurgical processing, e.g., by smelting and fefining). Open-pit mines include a large hole in the ground surrounded by piles of waste rock that were removed to reach the ore body and by beneficiation wastes (tailings). Underground mines have a tunnel or shaft entrance and tailings, but no pit or associated waste rock unless they are the downward extension of an original open-pit mine. Mineral operations commonly cover a few square kilometers and are relatively small in area relative to other uses of land such as agriculture and urbanization. In addition to the immediate land disruption, most mineral operations are associated with a "halo" of natural and anthropogenic pollution that impacts surrounding water, soil, and air. Most modern mineral extraction operations are subject to environmental regulations that lessen anthropogenic emissions, but earlier operations were not and their detrimental legacy has created a major hurdle to future mining. Although the ecosystem cannot be restored to its original state prior to mining, land reclamation is possible. Improved practices and better communication about these practices will be a critical requirement for societal approval and acceptance of mining in the future. The second land-related challenge to mineral production is access to land for mineral exploration. Although great advances have been made in our understanding of how mineral deposits form and the factors that control the distribution of mineral deposits in Earth, most of this knowledge can be extended to depths of only a kilometer or so. The search for deposits is complicated by the fact that most deposits can be detected through remote sensing methods (e.g., gravitational or electrical) at distances of only a few hundred meters from the outer limits of the deposit. This stands in contrast to oil and gas exploration, in which seismic methods can provide good guidance from relatively great distances. Finally, many deposits that are discovered are too low grade to be mined with current technologies. As a result, mineral exploration must examine very large regions to find just one deposit that is economically recoverable. Previous experience with land usage in mineral exploration suggests that the search for new, deeply buried deposits, including sampling the subsurface by drilling, will require access to areas that are thousands of times greater than the area of land that is eventually mined. This means that access to land for mineral exploration poses a critical issue in the future and that land classification schemes should not exclude this important use. In this context, it needs to be recognized that mineral exploration does not usually have a major impact on land and, at most, involves drilling one or more holes from a platform similar in size to a large truck. The public's aversion to mining and potentially increasing difficulty of access could exacerbate geopolitical tensions in the future. (assuming current technologies). Similar results could be expected for other metals. Most of this increased energy and water demand will be in the mining and benefi ciation stages of the metal production life cycle as a result of the additional waste material, which must be handled and processed. In addition, increased energy is likely to be required for exploration and identification of future resources, particularly those at greater depth. The availability of secure supplies of energy and water of sufficient quality will thus be critical factors in the long-term viability of many mining operations and may, in fact, prevent some deposits from being developed. In particular, this could be the case in remote locations, where limited water availability is already causing locally significant problems. Water quality impacts various processing operations (e.g., flotation, flocculation, and eventual recovery of water). In addition, water resources could be affected by the release of other waste material, which has serious implications such as contamination of groundwater resources. While the increase in demand for energy and water for production from deeper or poorer deposits cannot be avoided, it might be possible to limit the magnitude of this increase. In terms of energy, possible options include improved mining practices to reduce the amount of waste to be handled and treated, performing more ore breakage in the blasting stage prior to crushing and grinding of the ore, utilizing more energy-efficient grinding technologies, and use of alternative processing routes, such as in situ leaching. Currently, most operations rely on fossil energy resources, which have significant negative impacts on the environment and result in large amounts of greenhouse gas emissions. With wider use of renewable energy technologies—namely solar, wind, biomass, geothermal, and waste-to-energy—energy may become less of a constraining factor. However, each energy alternative has both costs and benefits that must be weighed, often implying additional material demands (i.e., specialized materials required for fuel cells or photovoltaic panels). Conservation, energy efficiency, and a diversity of low carbon (and low overall environmental impact) energy resources will be required to lessen the impact of energy requirements for mineral extraction in the future. Possible ways to reduce water consumption include treatment and reuse, using water of a quality suitable for the application, and alternative processing routes such as dry processing. Figure 11.2 Diagram of secondary production challenges, indicating respective impact factors for losses. EoL stage, it might be discarded, treated in a municipal incineration or waste-to-energy plant, go to a defined waste dump or landfill, be stocked, or enter a recycling chain if the recyclates have sufficient economic value. In the first case, any metals contained in the product will most likely be lost; in the second case, the waste dump can form a tertiary stock which, in the future, might be mined for its metal content; in the third case, a delay could result in recycling or reuse if the stock is again mobilized. Figure 11.2 illustrates these options in more detail than Figure 11.1. When material enters the recycling chain, it passes through the stages of collection, pretreatment, and end-processing. Although they are usually conducted by different stakeholders, the processes are interdependent, for example, in that the quality of preprocessing impacts the performance of the subsequent end-processing step, or technological innovation in end-processing might require different output qualities from preprocessing. Losses of products or materials can occur at various stages along the life cycle as determined by four main parameters (see Figure 11.2). First, material properties include the physical composition or degree of complexity determined by the variety of substances contained in the product and their interconnect-edness, and the value of contained substances at given market prices. Next, technological descriptors include selectivity to separate target substances, ef-fi ciency of substance recovery from individual processes and from the total process chain, processing costs, and environmental impacts. Technological performance is highly impacted by material properties, especially product complexity. The fundamental limits are defined by thermodynamics, physics, and also economics. Costs and environmental impacts include requirements for water and energy, as well as the handling of final waste, treatment of effluents, and off-gas. Third, societal drivers include consumer awareness and initiatives, the availability of a take-back infrastructure, the ease of returning EoL products, the legislative framework and its enforcement and control, as well as economic incentives. Finally, life cycle structure is of fundamental importance. Basic differences exist between closed systems, typical for industrially used products, and open systems for postconsumer products. The latter is characterized by frequent changes of ownership along the life cycle, high and often global product mobility, a lack of downstream transparency because manufacturers generally lose track of their products, and informal structures in the early steps of the recycling chain, which—if recycling takes place at all— often lead to highly inefficient and polluting "backyard recycling." Life cycle losses in open systems are inherently high. Clearly, closed systems are more transparent, easier to manage, and usually have the right conditions to obtain high overall life cycle efficiencies due to more traceability and control over the life cycle (Hageluken and Meskers, this volume). Built infrastructure, including dams and roads, accumulates in the technosphere, but is generally used for longer time periods. Material properties and available technologies determine the technical feasibility and economic attractiveness of recycling, which can be enhanced by appropriate product design, reliant on a database that indicates these properties (Reuter et al. 2005). Citizen iniatives, legislation, and life cycle structure constitute the environment for change, and failures often reflect weakness in these factors. A recycling society requires more than legislation and technology; the complete system, as described above, and the interests of the major actors need to be grasped by all stakeholders and subjected to analysis from multiple viewpoints (e.g., see, Hertwich 2005). Effective analysis will have to integrate these phenomena with increasing realism. The main requirements for secondary production are product recyclability (defined by design), an appropriate life cycle structure and its infrastructure, and best available recycling technologies. Ease of disassembly, the avoidance of inappropriate substance combinations, and built-in features that support product take-back play important roles. Nevertheless, an optimal design can never guarantee that a product will be recycled. For this, an appropriate life cycle structure, including the active cooperation of citizens supported by legislation and marketing efforts, is critical to help gradually restructure open systems into closed ones. Keeping the product traceable throughout its life cycle and ensuring that recycling at EoL is attractive and will indeed take place are the most crucial measures to close the loop. While a recycling deposit on a new product may help, more fundamental approaches include changes in business models, such as the leasing of products or selling functions instead of products. Products with high global mobility (e.g., cars) require a global recycling infrastructure to ensure their collection worldwide. The subsequent steps in the recycling chain may not necessarily take place in every country but may instead rely on, as in product manufacturing, an international division of labor that benefits from specialization and economies of scale. Best available recycling technologies maximize recovery of valuable resources in EoL products. Technology evaluation should follow eco-efficiency principles, meaning that both environmental and economic impacts need to be explicitly considered. Main challenges occur for complex products and new products, which often require innovative processes for material recovery (e.g., photovoltaic panels). Total efficiency is the combination of individual efficiencies along each step of the life cycle. The weakest link in the chain has the largest overall impact on losses. Today, in most cases, the weak link is a low collection rate, followed by the use of inappropriate recycling technologies. 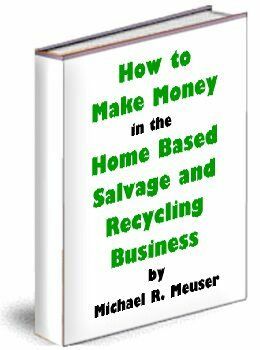 Lack of recyclability is usually of lesser impact. Manufacturers of electric goods, electronics, and vehicles can benefit from taking over producer responsibility in a stricter sense. Designing products with good recyclability, collecting them at EoL, and feeding these into controlled, effective recycling chains would generate in-house supplies of raw materials. This, in turn, would improve supply security for potentially scarce metals as well as deliver an accountable environmental contribution, which is a better proof of a green product than design for recyclability alone. Such take-back and recycling activities can be outsourced as long as the actual material flows are well controlled right to the final destination. Consumer demand for material-intensive products will increase as global population grows and higher standards of living are sought in developing and transition countries. This increase seems certain, despite any potential offsets through changes in lifestyles in rich countries. Technological innovations in industries directly related to material mining, processing, and product manufacture will improve material productivity but also create new requirements for critical materials. Intensive recycling can be anticipated but faces numerous technical, economic, legislative, and behavioral obstacles; there will always be a need for mining additional primary materials from the lithosphere. These challenges are interdependent and yet unfold simultaneously. Different assumptions can be elaborated into alternative scenarios about the future as a basis for assessing the feasibility, costs, and environmental impacts of various ways to address the challenges posed by future mineral requirements. Various types of models and databases exist and are under further development for parts of the system, including system-wide optimization models. At one extreme, there are models of material properties at the atomic or even subatomic levels. On the other, policy-oriented models exist that focus primarily on human behaviors and economic incentives. Below we describe three families of models and applications that cover a wide middle range: from given materials to products and technologies and production and consumption activities. Thereafter we offer an order-of-magnitude look at long-term constraints, and describe research questions that are relevant on a time frame of several decades. The methodologies of material flow analysis, life cycle assessment, and input-output economic analysis have been utilized individually to gain insights on metal stocks and flows and their environmental and (in the case of IO analysis) economic implications. Increasingly, these methods have been used in combination to address more complex questions (see, in particular, Suh 2009). However, much remains to be done before scenario analysis is able to capture the interrelationships between economic development; consumer behavior and demand; metals and other materials linked to consumer products; the various physical, economic, and institutional constraints that surround mining; the interests of multiple stakeholders; and technological innovations, both within the minerals sector as well as in other related sectors. More intensive collaboration across disciplinary borders and further expansion of the conceptual frameworks are needed and can be anticipated. (Müller 2006; Bergsdal et al. 2007). Global dynamic technology-based MFA models have also interconnected elements and products, and linked these to mining and metallurgy as well as environmental impact (Reuter and van Schaik 2008a). MFA can be linked with LCA to examine environmental impacts of products or processes during mining, product production, use, and waste management. LCA is a tool to support systematic assessment of the environmental implications of a product, service, or project throughout its life cycle: from resource extraction through EoL (guidelines for completion of an LCA are presented in ISO ). The environmental performance of mining, extraction, and processing of many metals (e.g., copper, nickel) and products has been examined through LCA. Fewer studies have evaluated EoL aspects, including recycling. Norgate and Rankin (2000) completed an LCA of copper and nickel production and Norgate and Rankin (2001) examined greenhouse gas emissions associated with aluminium production. Metals and large numbers of other materials have also been included in LCAs of complex products, such as those involving automobiles and their components (for a review, see MacLean and Lave 2003). Powell et al. (1996) completed an LCA and economic evaluation of recycling, whereas Rydh and Karlstrom (2002) examined the recycling of nickel-cadmium batteries. LCA identifies opportunities to minimize the shifting of burdens on the environment from one life cycle stage to another. LCA studies have highlighted environmental burdens associated with metals, materials, and products and have informed government, industry, and other stakeholders about associated environmental impacts. Leontief et al. (1983) first used an IO model to quantify the extraction and sector-specific use of nonfuel minerals throughout the world economy, in response to alternative scenarios about future demand and technological changes. 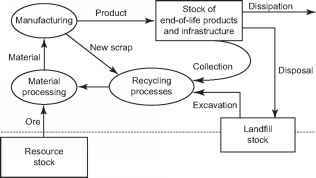 More recently, Nakamura and colleagues ( e.g., Nakamura and Nakajima 2005) developed "Waste IO," which involves the compilation of a detailed database about material use in Japan and an IO model that explicitly represents both material use and recycling sectors. The first initiatives linking LCA and IO include those of Cobas et al. (1995) and Kondo et al. (1996). For additional detail, see Hendrickson et al. (2006). In recent work, Stromman et al. (2009) integrated LCA data into the database of an IO model of the world economy to examine the environmental and economic impacts on different stages of the aluminium life cycle, of trade-offs between cost and carbon emissions reductions, and reduction of carbon emissions. Yamada et al. (2006) and Matsuno et al. (2007) developed methods to track material flows through an economy using Markov chains; however, without an IO model, these studies lack an explicit representation of product flows. Duchin and Levine (submitted) extended the Markov chain method to relationships between resource flows and product flows by integrating IO modeling of product flows with an absorbing Markov chain approach to tracking material flows. They displayed the properties of resource paths in the case of a static, one-region model, generalized the methodology to a global IO model, and described the features of a dynamic global IO model, where the latter tracks stocks of resources, and of the products that embody them, as well as flows. In summary, MFA tracks material and energy stocks and flows in a defined system; LCA inventories inputs and discharges associated with a product at all stages of the life cycle; and IO models the entire economy, examining economic transactions among sectors, increasingly incorporating MFA and LCA data. All of these approaches address parts of the puzzle using actual or illustrative data to take on the broader, challenging questions that are only now beginning to take form. They, along with other scientific and engineering models, provide the foundation for expanding the conceptual scope, the databases, and the methodological "toolbox" for anticipating and addressing future challenges in the provision of society's material base. Here we examine how physical availability may in the future be a constraining factor for mineral commodities and whether energy, water, or land resources are likely to limit access to them. Several studies (Spatari et al. 2005; Gordon et al. 2006; Müller et al. 2006) have concluded that some in-use stocks have reached the same order of magnitude as identifi ed minable resources in the ground. However, Kesler (this volume) demonstrates with the example of copper that undiscovered resources are probably several orders of magnitude larger than those discovered. Today, mining and processing of metals utilize about 7% of total world energy and 0.03% of total world water use. Below we explore potential future demand for Cu and associated input requirements. We acknowledge fully that the system is far more complex than the analysis here; however, our intent is to illustrate some of the key interdependencies between metal extraction and key resources. Secondary = PxUx r x (1-a), where P = population, U = per-capita Cu use (kg/capita/yr), a = net stock accumulation rate of Cu in use, and r = (old) scrap recovery rate. Estimates (see Table 11.1) were made for the year 2006 and for two hypothetical future scenarios based on population estimates for the year 2050. Scenario H1 refl ects slow growth of Cu use with substantial technological improvement while scenario H2 refl ects fast growth with low technological improvement. Table 11.1 Copper scenarios made under the following assumptions: Population data (UN 2007b); average amount of Cu entering use in 2006 based on USGS (2009); and transfer coefficients for new scrap generation and Cu alloy recycling taken from Grae-del et al. (2004). H1 assumes double the current average global per-capita consumption (one-third of the current U.S. level); that Cu stock in use has reached a steady state so that the same amount of Cu reaches EoL as is entering use; and a scrap recovery rate of 0.8 (which would require improvements in sorting, processing, and refining technology). H2 assumes a catch-up of all countries to the current level of the U.S., where Gerst and Graedel (2008) determined Cu use for the year 2000 to be 13.2 kg/capita/yr. Stock increase in H2 was based on the assumption of an increase in materials in use and long product residence times. Net stock accumulation rate is assumed to decline both scenarios. Scrap recovery rate increases in the scenarios due to declining ore grades and the resulting competitive advantage of secondary resources.